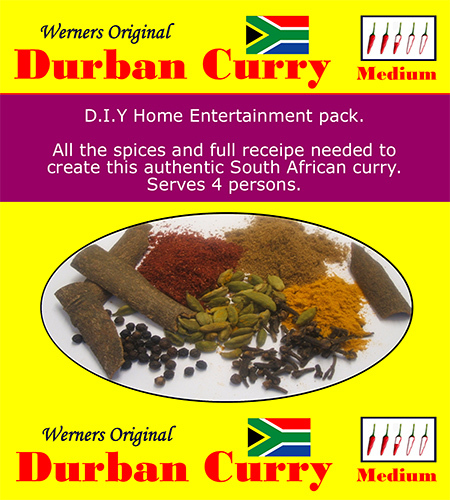 Werner has been making delicious Durban Curry for friends and family since 1995 and has solved the demand for the recipe by producing this 'all inclusive' spice packet so you can create this Durban style Curry in your own home. Demand from the public resulted in the launch of the Bobotie and Mauritian Curry packs over the next couple of years. Our packs take all the hassle out of having to go to many spice shops to find all the ingredients needed, and often overstocking items. Based in London, we mix each batch of these lovely spice packs by hand, so small variations in strength may occur. We sincerely hope you love these products and look forward to hearing from you personally with any comments.